Recall the Uttarakhand floods of 2013. The most corrupt, inefficient and lethargic Congress govt in the State and the Centre handled the natural disaster in the most callous manner. There were 6000 deaths and a large number of people still unaccounted for. Even Congress puppet Scroll reported compensation wasn’t paid to many even two years after the disaster. DailyMail reported the disaster shamed India’s disaster management system. 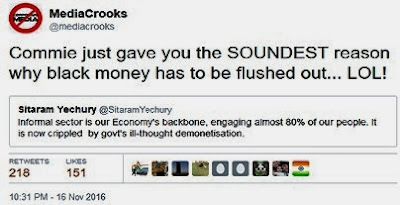 These are the same Congis and Commies screaming and ranting about the suffering of the poor over demonetisation. This is an economic measure that affects the whole country and not just one small state or corner. Considering the huge task of feeding new currency notes to banks, exchanging old notes, getting ATMs to work is an extraordinary accomplishment. From the metros and urban areas to mountain regions and far-off NE towns that we may have never heard of, the GOI had the burden and responsibility of reaching new currency to back the demonetisation decision. This was naturally bound to cause a good deal of hardship to people. But they braved the troubles and backed the ModiSarkar over demonetisation because people are sick, tired and contemptuous of black money and corruption. The decision was taken with absolute secrecy and announced suddenly and therefore, naturally, entails a lot of unanticipated problems and issues. Ghulam and Congress MPs are all now victims. Firstly, the claim of 40 deaths due to demonetisation itself is dubious. Some of the deaths were proved to have no connection. And the argument is generated by a bogus article by the Commie HuffpostIndia and written by none other than Modi-hater Shivam Vij. It even claims a man died at home watching Modi on TV. Mind you, this is not peak summer when it would have been possible for some weak people to collapse to due to heat or dehydration. Modi’s 92-year old mother went to a bank to exchange notes. So there is good reason to believe any death is incidental or more by a pre-existing cause. It is outright stupid to even link demonetisation to any death whatsoever. Sure, there might be cases where a hoarder or two may have committed suicide because the old notes became garbage. A tangled web? It’s all very nice to be poetic but it cannot alter the fact that the surgical strike on black money was created with greatest secrecy and the logistics were phenomenal. It is inevitable that in such a situation new problems and issues will crop up. Only uneducated journalists would assume it would be smooth-sailing when even ordinary folks don’t expect that. Therefore, to adapt, be flexible and handle problems and issues that keep cropping up is a phenomenal accomplishment by ModiSarkar. Imagine having to drop food-packets in the state of Uttarakhand during the floods and then imagine having to drop currency packages all over the country to every nook and corner of India. This is something scoffing, mocking, Congi-bootlickers like Shekhar Gupta, another unfortunate victim, can neither fathom nor imagine. You and I can because we are not jaundiced with raw hatred that Gupta and his ilk possess for Modi. Predictably, feeding on Gupta’s stupid comment, the “Fashion-street intellectual” Sadanand Dhume from the US chips in with this becoming a “command and control” economy. Laughable! Yes, indeed! Despite the best efforts of some third-rate CMs people have been peaceful and supported demonetisation by their willingness to go through the pain of long queues, cash-less ATMs and strained wallets. 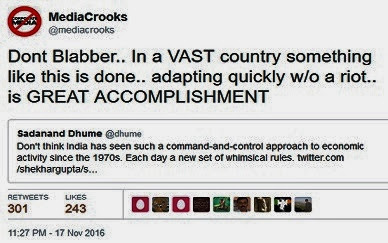 Bill Gates applauded the demonetisation move but Dhume forgets that his adopted country couldn’t tolerate the results of a clear election result and broke out in violence. These desi idiots from US still sermonise and look at Indians here as third class citizens of the world. Indians now laugh at the intolerant Americans while peacefully adapting and welcoming demonetisation to curb black money and corruption. It is a bit surprising that these silly journos think that in this day and age of SM they can still get away with their stupidity. “Journalists are not very bright people” I keep saying. And they unfailingly keep giving us proof every minute of the day. This same Ravish implied in another street show that the GOI was gobbling up large deposits from the public with which large loans are written off. Does this duffer even make any sense? 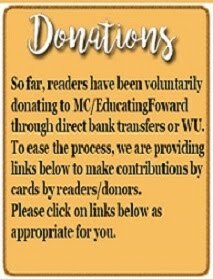 Does any govt or entity need money from anywhere for a book-based write off of a loan? Writing off debts follows certain accounting standards and principles and has nothing to do with getting cash-flow from anywhere. But media-Pappus like Ravish believe “Who cares, if the public can be fooled, we still win – to hell with facts”. Unfortunately, for such liars, they got roundly booed by the public with chants in favour of Modi. Arvind Kejriwal and AAP have pulled out of Mumbai and Chandigarh municipal elections. I’m not sure AAP is left with enough “cash” to contest Punjab either. Those who are ranting the most against demonetisation have never cared two hoots for the poor, the unemployed or sought equality of all citizens. All those whining have only divided India, pandered to vote-banks and cornered vast amounts of wealth for the party and themselves – mostly in black. Demonetisation is hurting these surgical victims very badly. LET IT HURT! You are absolutely right. These "Third rate politicians", Anti-Modi MSM, So called Intellectuals et all are ranting and raving not for the poor - but they are worst hit as their crores stacked has gone to the gutter overnight. That is making them sleepless and they are all ganging up against Modi ji and by doing that they did not make even a small dent in Modi ji's popularity (It has actually risen dramatically after this strike) - They do not understand they are losing their already rock bottom credibility in the midst of common people. So no need to worry. Let this happen and they will be losing more and more. Dear bard Cacophonix, thy sonnets ring so true! As always your timely and to the point analysis of anti demonetization ranting by anti Modi brigade is correct and every sensible person understands it. I always wonder why the CON party never fields the greatest economist PM they have in their ranks in any of the debates in RS let alone the media. By his silence is he implying that he is with Modi. MMS is a pathetic stooge. He will do whatever his boss orders. Great economist? Great toilet paper more like. Use and throw. 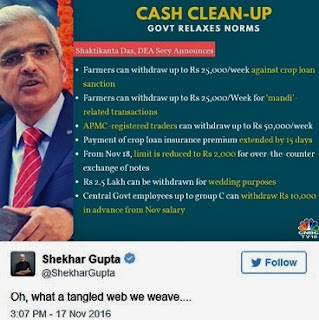 Black money makers namely - business people, professionals like lawyers and doctors, babus from village Patwari to secretaries, politicians to name few have enslaved common people in slavery of paying bribes just to survive in jungle of corruption full of corrupt beasts of all sizes and tastes. Modiji has given call of freedom from corrupt that is no less epochmaking than freedom struggle. People know this Is NOW OR NEVER battle so do corrupt. Battle will be long but we will win. Modi requires few more sincere ministers and leaders to work his agenda for clean India programs, none of his ministers have any mass base nor have the vision nor skills of oratory. That is the biggest BJP's weakness. Neither the banks are coming with a solution, like a donkey reluctantly doing the job, banks are not acting in swiftly for they are also got used to regular 9-5 jobs no dynamism in the system. BJP to infuse private technocrats than relying on this Babus. You are right. Many of the BJP ministers are clueless or crooks . Why is Mr Modi tolerating this fellow Jaitley? Several banks are working from 9:00 in the morning to 11:00 at night. Arun Jaitley made a statement that under the circumstances, the implementation of demonetisation was done the best way possible. Ravinar is saying pretty much the same thing. I worked in a Public sector in India. I know how my staff use to work during the month of March being Financial year end period. I know when situation demands public sector banks will work very hard. During regular hours they relax a bit. That is also true. But you find bad apples in all baskets. Great move by our most visionary leader Resp Narender Modi .He is a visionary leader .As our PM always says we can all decide in 2019 weather he needs second term or not seeing his work.I think he should serve as PM till at least 2029 . Mrs Gandhi? Why are we fan of her? For emergency? Or for losing the Bangladesh war on negotiation table. What the soldiers had won in battlefield? Can we please come out of this family's bhakti? हरामी मीडियाइयों समेत सभी चोरोंपर सीधा व मर्मान्तक प्रहार! In all fairness one must admit that the public support that the govt is getting,on this issue, is largely the generosity of the leftist liberals. Any action by Modi was attributed to his association with corporates and the rich.So now when the public senses a chance to ground those filthy rich, the libtarts have no answer. Our super secularist Ravish Kumar was analysing the reason for the worldwide rise of the right wing forces. Those on the debate were confirmed secular libtards who made sure not to apply salt on Ravish Kumar's wounds. Now the "death toll" has gone up to 50! 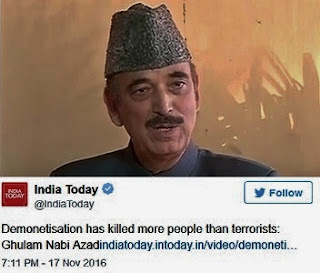 Very soon we may find these ambulance chasers at the gates of crematoria to interview Congress,AAP or Commie plants to declare from there that most of the people are dead due to demonetization.Queues are disappearing everywhere.But not from media head lines.MSM screamed other day that Election Commission has asked FM not to use indelible ink.That turned out to be blatant lie.This nautanki is likely to go on till 30th of December.Modi has given them so much to chew and spew. If only 1 dynamic minister with a mind of his own and subject knowledge can take charge of finance, there will be 1+1=11 for this Govt. Bring in Swamy, he may create noise but is a original thinker.. I am feeling extremely pathetic,b cos Victims are getting hurt day in and out,everyday.Cant hear this everday. Can't modiji feel the pain,that guruji felt and Victims was victimising him for a decade. What is pain can't be defined at the moment . Prahar karo guruji. The Forces are with you,though they might b in dilemma for sometime. That's fine,as the bimari disappears we will all breadth a new life. Funding was carried out primarily by supplying fake indian currency notes of 500 and 1000 rupees denominations. PM Modi would be surely under threat of those who have been adversely impacted by surgical strike on dirty money. The Congis, Commies, samajwadis , BSPites etc screaming and ranting about the suffering of the poor over demonetisation, are betraying their frustration and cynicism. The country solidly stands behind Modi ji against his detractors. Which category did those REDDI PIGS( 500,00,000,00 rs . Wedding fame ) belong to ?? Imagine the lehanga of the REDDI PIG'S daughter ...it cost 2,00,000,00 rs. !! Is'nt it fantastic ...that this REDDI ( BJP EX-CM and Ministers) wedding evades the attention of the Mahatma PM MODI and his team ?? So did Mahatma Modi ji attend this super 500 crore rs . wedding ? basic attitude should change any Indian weddings and function appears grand and Indians are happy to spend for weddings as a tradition. being rich is not a crime to call names. real sufferers are those who earned easy money and evaded the taxes. 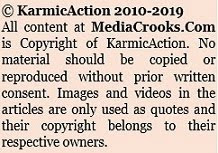 They may be at least in crores from all trades. Fantastic Blog. Ravinar pretty much covered almost all anti-Modi brigades reaction. Two more left out were SC and Akhilesh Yadav. SC judge indirectly gave his OK to people to riot in the streets and Akhilesh said that the black money is a necessary for remaining afloat during the depression !! Wonder why all countries don't have a lots of black money? And Mamta's suggestion? Let people use old 500 Rupees notes with new 500 Rupees notes !! Genius isn't it? Seems like Pappu, Kejriwal, Akhilesh, Mamta are competing for the lowest seat in intellectual level competition. In the last few days, I have had some of the strangest experiences of my life. Communists bewailing the persecution of the rich hoarders of black money. Communists demanding the prohibition of income tax, making India a Banana Republic or Emirate. Communists outraged and inconsolable over a handful of random deaths in queues. Here the problem is that Bank employees will become the new babus. We are only shifting the onus from Income tax to bank. Can we say now "Terror Support Service " is largely dismantled ? I think so .. if not fully , Its about to happen soon ! This Gov do listen to "People's voice" ! Thank you for every thing you have done and everything you are doing ! Yesterday burkha has done the most unethical/ illegal interview to Kejriwal. where she deliberately indulged in propagating fear among common citizen bank savings. does any body bank savings ever get effected , when bank write-off loans ? its time for surgical strike on such channels ! Freedom of speech and expression is being misused. Hope sane and knowledgeable individuals interview these people in public fora. Its not solid support but fear among people with this kind of sudden move keeping them silent. When failed to use force against terrorism, naxalism & maoism govt has burdened common man by making them stand in long queue for there own money. Excellent Article. Hard hitting and to the point. The beauty of the situation is that those who are really hurt cannot complaint, much like a thief's mother who is forced to conceal her grief. The real victims are those using fake notes to fund terrorism and making money from extortion and infiltration. Muslim businessmen running all-cash no-tax activities of dubious nature have been worst hit. Serves them well. The statement "It is outright stupid to even link demonetisation to any death whatsoever," is not correct. There are reports of some people dying in queues for new bills and some bank staffers collapsing on duty. Ravinarji has been very accurate on facts which lends credence to his acidic barbs against the presstitutes. That reputation must be guarded zealously. Also, a word of praise for bank employees would be in order. I support demonetisation and dont mind Qs etc. However I have been disappointed by the amount of black money unearthed. One only gets to hear about 50-60 lakhs here, a crore there.RBI/GOI should publish a ticker of total confiscated uptil now. At least it gives citizens a sense of the scheme working in the right direction. Moreover there is news about 1 crore black money confiscated disappearing from a police station? 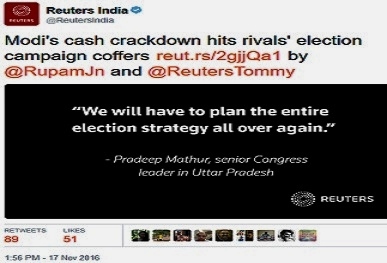 So is one to believe that black money will find its way to mainstream and the guilty wont be caught? Also the issue of fake currency. Will it be caught or will the stress on banks prove to be the undoing for this aim? Heard about 11000 being deposited as fake currency since the post master did not have machine to verify. Again the objective is defeated. If banks are confiscating fake currency, they should release these stats also. If banks are unable to detect fake currency because they are so good, that again spells doom for the scheme. Anycase I am praying with all my might that the situation becomes normal in a few days. Modi embarked upon winner takes it all risk and because of careful planning is succeeding in this game. 36% high value notes deposited in banks in 10 Let parilamentary debatedays as per RBI Report. All those silent guys in Government, Currency Presses, logistics people, RBI Currency Management teams and bank employees working on war footing at crowded places are real heros and deserve special commendation. It will be a fascinating story of how risky decisions are executed. If one goes thru RBI Annual Report 2015-16 and MOF Report 2015-16 you will get plenty of tidbits about beforehand planning. Neither idiot Journos looking for 2 line - 3 second byte nor opposition politicians who were in government but always looking for 'big picture' rather than details will because of utter lazy nature will refer to it to understand WTF is goimg on and why it is wrrking. There would have been universal acclamation for Modi's action, had the RBI released Rs500 notes alongwith Rs.2000 notes on 10th itself. Now there is cash crunch and common man cannot use Rs 2000 notes because of change problem. What is the use of Rs 2ooo notes stacked in ATMs? Nobody is drawing them.